* Does your game feature gritty asteroid miners, or blaster-waving fighter jocks? Choose the space travel and technology that give the right feel for your campaign. * Looking for character ideas? Here are templates and advice to help an adventuring group get together and stay together. * Do you want a bug-eyed monster, or a realistic ecosystem? Use alien-design chapter to build them all! * Need a planet? How about an asteroid, or a Dyson sphere? The worldbuilding chapters provide step-by-step instructions. * In a hurry to play? Each step of the world- and alien-design instructions lets you roll randomly and get results that make sense. Roll up your next planet and let the adventure begin! GURPS Space will help you create campaigns of every style, from science fantasy to space opera to realistic. Recreate your favourite science-fiction background, or develop an original world of your own. With GURPS Space in your hands, the future is yours! GURPS Space requires the GURPS Basic Set, Fourth Edition. 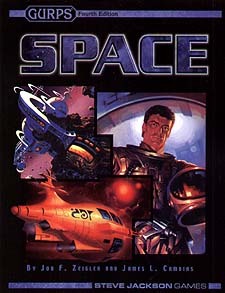 The information and advice on technology, worldbuilding, and alien design can be used as a resource for any space-based game.